In the Blog before “Try different menu items”, I learned that not everyone looks at the whole menu. A lot of people know what they are getting before they walk through the doors of Pappagallo’s Satellite Beach. There are so many great items on the menu! For example Homemade: Pizza, Stromboli, Calzone, Pasta, Subs, Salads, Burgers, Appetizers, and Desserts and recently Handcrafted Cocktail with the addition of the liquor bar. This reminds me when we added the Bar inside the restaurant and outside on the patio, People did not realize that we had added liquor to our Beer and Wine. This took quite a few months to get people to know we had this new addition to Pappagallo’s Satellite Beach. Have you seen the pictures of these refreshing hand crafted drinks. Check out the pictures on our Instagram Page (Pappagallos) and our Facebook Page (Pappagallos Beachside). The best selling hand crafted frozen drink the Pappagallo’s Satellite Beach Bartenders have come up with so far has been the Mango Basil Margarita. That’s not a typo, this delicious Margarita has mango and basil in it. I know you thinking that herbs should not be combined with sweet fruit like mango. You just have to try it, it is pretty darn good if I say so myself. More about the Bar in another blog. Back to making pizzas easier for guest to order. A few of our regulars had trouble ordering there pizza. They knew what they wanted but if you ever played the telephone game (whisper a word in the ear of the person next to you and they do the same as it goes around the circle, but that word never gets back to you.) their pizza was always good just had a twist to what they ordered. So we decided to make a button for them. Now we have the Penny’s Pizza and the Al’s Pie. The Penny’s Pizza is a Garlic base pizza (no marinara on this pie) with all the toppings of the Deluxe pizza on top (Pepperoni, Sausage, Mushroom, Bell Peppers, Black Olives, Onions, and Extra Cheese. Now that there is a button she loved telling friends about her pie and tells them that the button is in her name. Just order the Penny Pizza. Al’s Pie, again this pizza has no marinara on it. This is a Three Cheese White Pizza with Fresh garlic as a topping. Sounds simple but is so flavorful!! This is a must try. We also have an unruly but regular long time customer that decided one day to start requesting something he likes that he can’t get good anywhere. Another table of long time customers over heard his request and seconded it. This took a few times to make it to the table but Dave said he could make it and so he did. This special has been named after said unruly long time customer, The Jimmy-D’s meatloaf Special. This meatloaf is so good, like I said before if the staff loves it you know it’s good. Dave usually preps a set amount and the staff hopes that we don’t sell out so they can take one home, or at least get a spoon full of the homemade mash potatoes. First one on the menu is my personal favorite and has a nice story. Chicken Pastagallo was somewhat of a challenge. You see Dave and I were at an Italian restaurant and I ordered a pasta dish that was so good. I was telling Dave how good it was he had to try it (which he usually don’t like to try my food). He tried it and said I can make it better. The next day at the restaurant he made up a dish and said now try this. It was even better then what I had the night before, I said this needs to go on the menu. So then we had to name it and since it is a Pappagallo’s creation and has chicken in it, the name Chicken Pastagallo came about. 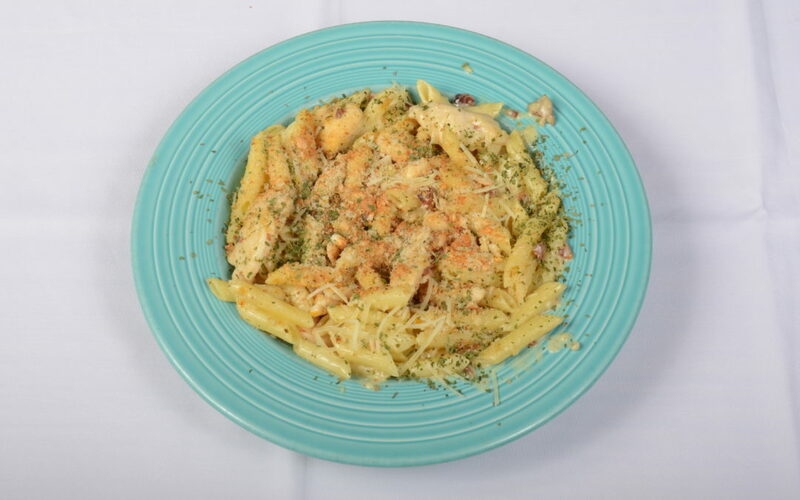 This dish had Grilled Chicken, Smoked Bacon, and Parmesan baked in a Creamy Rosemary Cheese Sauce and it is served over penne pasta. This spectacular dish (if i do say so myself) comes with a side salad and a homemade garlic roll so you can soak up all the delicious sauce left in your bowl. The Chicken Pastagallo bowls usually come back to the kitchen licked clean. The smell of this dish will get your attention as it comes to your table or passes your table. Next up is the Tortellini A La Panna, so delicious. This pasta dish is made up of Diced Capicola Ham (Italian Ham with a little spice), Sweet Peas which is sauteed in a Parmesan Alfredo Sauce, served over Tri-color Cheese Tortellini. You have to save some of your garlic roll to soak up that sauce. A traditional dish Chicken Vodka (or chicken ala vodka). This dish is an eye catcher when it comes out. Yes this dish is cooked with Vodka, Tomatoes in a cream sauce with Chicken, Onions, Fresh Basil, Parsley, Bacon, and Red Pepper Flakes over Penne Pasta. Cacciatore is another traditional dish. We have two on our menu. First up is the Chicken Cacciatore… Boneless Chicken Breast Medallions, Mushrooms, Bell Peppers, and Onions sauteed in Marinara Sauce and served over a bed of Spaghetti. The other option is the Albino Cacciatore for those that don’t care for red sauce or looking for something different. This is prepared the same way: Chicken Cacciatore… Boneless Chicken Breast Medallions, Mushrooms, Bell Peppers, and Onions… Here is where it is different. They saute it in a White wine and again served over a bed of Spaghetti. You should definitely try both of them. Are you in the mood for Spaghetti with Chicken? Then you should try the Chicken Parmigiana. This dish has a big portion of Seasoned Homemade Bread crumbs coated on the Boneless chicken breast added to a side of Spaghetti topped with Mozzarella cheese. I bet you can’t eat the whole thing. Of course you have to eat the salad and garlic roll that comes with it.